It is an excellent blood cleanser, styptic for wounds, a bitter digestive tonic, as well as a soothing tonic for the lungs when there is a cough. Not only will it help to break up mucous in the lung lining it assists in keeping the lungs clear. Used for centuries as a blood cleanser, a plant that will stop bleeding (hence a folk name of nosebleed plant). As mentioned it has a tonic effect on the lungs as well as the digestive tract and colon. The bitter taste of yarrow indicates it is useful for digestive upsets of gas and bloating. Though the taste is bitter the tonic effect on the intestines and colon may also be helpful in reducing the cramping of colitis and diverticulitis. This very bitter astringent quality also indicates it may be useful in reducing hemorrhoids and quieting diarrhea. The plant is also a useful women’s ally. The blood cleansing quality indicates it may be useful for reducing “blood toxic” issues like fibroids and cysts. Though it is styptic topically and will staunch bleeding, internally it is used to stimulate the menstrual flow when it is delayed. By breaking up “stagnant blood” fibroids and cysts are broken up and pass out of the body. 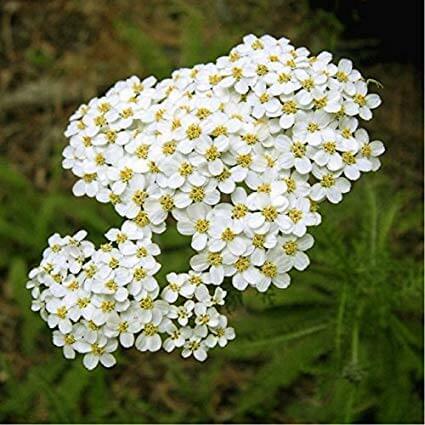 A buildup of the uterine lining can create these conditions and yarrow works as a tonic to prevent this from happening. Cysts and fibroids cause, not only pain but a “gushing” flow. Having a regular normal period monthly, where all blood is released, reduces this tendency. Yarrow is a favorite among flower essence practitioners, as well. Flower essences are used to treat emotional issues in the body. Plants used in this ethereal way offer psychic protection as well as a cleansing effect on the emotional body. Yarrow has been used for problems related to clearing toxins particularly radiation toxicity from the aura. It is also a plant that offers “protection” suggested by the umbrella-like quality of the flowers. The lacey leaf structure reminds us to be light and clear in our intent. Landscape varieties of yellow, pink and lavender are available and look wonderful in the garden, not to mention imbue a lovely scent. Health tip for this article, drink a cup of yarrow tea daily to keep the blood clean. It’s essential for a healthy body and with this plant, it sure can’t hurt.